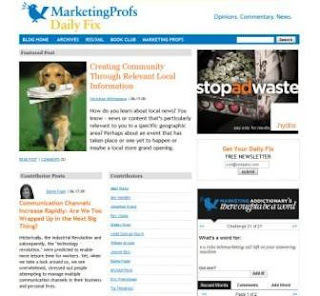 Over at the MarketinProfs Daily Fix, my recent article [the featured post on 6/17/09! ], has generated interesting comments. The article Creating Community Through Relevant Local Information addresses the role that local information plays in creating a sense of community. I'm curious about your physical localities - how do you find out what's going on? what tools do they use to communicate information and create that tight, connected community feeling? My solution and experiment as been a personal blog, The Smoke Rise Blog, created just about a year ago. It's a work in progress, but one that holds promise as it generates more awareness and connects with more readers in my town. I'm intrigued with the notion of local relevance. Relevance is something we strive to offer in website content, blog posts, tweets... Relevance creates connection and the possibility of engaging in conversation. Most websites, including those of most municipalities, post information. It's up to you, though, to remember to check the pages for new announcements. What if they offered RSS or email subscriptions? After all email is extremely effective, but how many organizations pro-actively gather the email addresses of local constituents for the sole purpose of offering relevant local information [which means that recipients respect the communication]? We have similar communications problems in the small city where I live, in suburban Westchester, NY. The local Gannett daily does a mediocre job of covering community news, and there's really no local radio station. Cable News12 covers the entire county, so local coverage is spotty -- only the big news of crime and scandal seems to get coverage. The city has set up a site, and they also do frequent email updates with community news. A few local individuals are doing what you've done -- started blogs and Facebook pages. Self-publishing with all the new tools we have at hand is becoming the new town bulletin board, reaching us directly at home, at work or on the road. Matt Churchill shares fascinating local data from Hitwise about Liverpool. Many search for relevant local information - and consistently don't find it online! I'm sure it's happened to you, too. Imagine the opportunities for local businesses, not to mention local governing entities, to create stronger connections with residents. I'm eager to see how my experiment-in-progress evolves. I'm encouraged and intrigued when I hear about other concepts. For example, the New York Times has created The Local [see HyperLocal News from The New York Times] with a blog all about Maplewood, Millburn and South Orange, NJ. Elaine says in her comment that "The organization I work for has spent the last several years addressing exactly this issue. Please visit NewspaperNext: The Transformation Project for all kinds of free (and one small paid) resources." She mentions a newspaper - The Gazette in Cedar Rapids, IA - that is becoming its community's Complete Community Connection (i.e., C3). The C3's change agent, Steve Buttry, has posted Blueprint for the Complete Community Connection, a fascinating read and thought-provoking document. C3 looks to have achieved what Sonny Gill recommends "...get the town's buy-in on this new means of communication and information." Sharon Elin suggests "a wiki .. for adding information about a local region... especially for permanent information such as local attractions. Current news could have a page that is in flux daily or weekly" or a "regional website, maintained by a Chamber of Commerce or any interested party. Here's an example from Lake Sunapee, NH." What other examples have you come across in your towns? Which ones are most effective at creating the sense of strong community where residents are better connected as a result of relevant information. And, by the way, if you think of your business' customers in a similar way, you, too, have the opportunity to create a strong community through relevant local information.